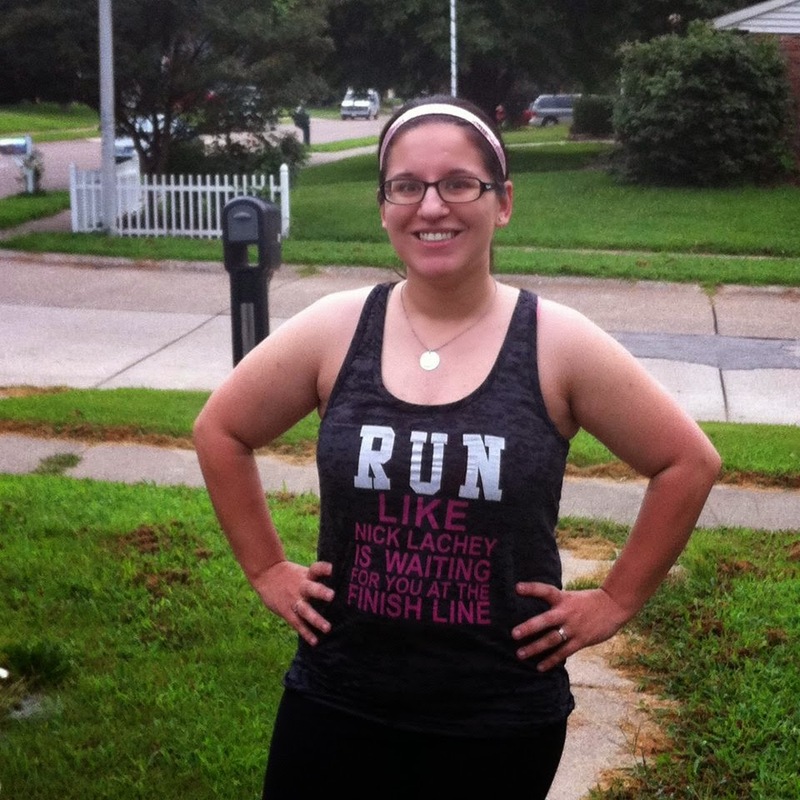 My friend Emily from Running Like A Mother is taking over the blog today! Hi there, Back Home Again readers! Here are a few tips that I’ve learned over the past year that might be helpful if you’re interested in getting into running! 1. Submerge yourself in the running community. Holly and I both live in the fattest city in the United States, has she mentioned that? It’s true. So you can imagine my surprise when I discovered there is an incredibly supportive running community here! I immediately joined a couple local Facebook running groups, which helps me keep up-to-date on races and other events. There are also running clubs with meetings and group runs -- all kinds of fun stuff. 2. Get the right gear. Okay, now the “right” gear means something different for everyone. All I can do is share my essentials. First off, and most importantly in my book, is my Garmin Forerunner 10. It’s a GPS watch that tracks your distance, pace & calories. And after you get home you can upload your run to Garmin.com and it’ll show you even more info -- route, elevation change, splits, etc. It will store your runs and share them with your friends, if you want. If you’re going to run with your phone or iPod, you aren’t going to want to hold them the whole time. That gets old after about a quarter mile. I personally use a Nathan Phantom Pak and I’ve been very happy with it. And speaking of phone/iPod, I also use YurBuds earbuds. I struggled with cheap earbuds falling out of my ears while running for months and months and finally gave in. Best $30 I’ve spent in a long time - they’re amazing! And you’re also going to need a good pair of running shoes. Head on over to your local running store and have them fit you for a pair. And just a tip, write down which shoes they suggest at the fitting, come home and price them online. It’s very possible you’ll be able to get a better deal! Running can be expensive - pinch pennies where you can! 3. Sign up for a race. It might seem intimidating at first, but register for a 5K. A 5K is 3.1 miles and it’s the perfect race for someone just starting out. There will be tons of other newbies there! Races have such a fun atmosphere. I guarantee you’ll cross that finish line with a smile on your face. I can also guarantee that you’ll be planning your next race that very same day. 4. Don’t be afraid to walk. When I first started running, walking breaks seemed kind of taboo. Am I really a runner if I walk, too? Jeff Galloway says yes! Galloway is a former Olympian, published author and one of the biggest names in the running world. His teachings encourage run/walk intervals to help prevent injuries, even for the most advanced runners. So no, there is absolutely no shame in walking! If you run, even just short stretches at first, YOU ARE A RUNNER. 5. Only compare yourself to yourself. It’s so easy to compare yourself to others in the running world. When I did my half marathon in April, do you know how fast the winner ran it in? 1:08:57. My time? 2:52:50. I would be a very depressed person if I stared at those numbers for too long. What you need to focus on is yourself. Improving your times and reaching new goals. I’m never going to win a freaking half marathon! I know that. But someday I’ll beat my time. And then I’ll beat it again. And probably again. The only competition you should have is yourself! point number 5 is great! people can run twice as fast as me and that's discouraging for sure. but really running is a competition against yourself and only yourself. Great tips and suggestions. I added this to my Pinterest page. Great tips. I remember the good o' days when we had to hold our phones/ipods while running. I hated it! Hahaha! I have an arm band for my iPod, but I have no idea where it is, so I still hold it! I have learned not to pay any attention to others. Otherwise I'd be worried about how I seem to stomp when I run! Good for you! I'm trying to walk regularly. I love it, but it's hard as I babysit, and if I don't do it the morning, I'm too tired to do it at night. Thanks for the ideas. The biggest thing for me is definitely comparing myself to others... I always feel totally inadequate and terrible... My husband is a runner and he definitely emphasizes all these things -so, he concurs!